Since we got home from our vacation in Maine, it has been all work all the time. So I decided to go back to vacationland for a much needed respite. One of the best things about photos is they take you right back to the moment and I actually felt calmer than I have in weeks just looking at the pictures. One of my favorite vacation memories is visiting Blueberry Hill. With a name like that I just had to visit it, because Blueberries for Sal by Robert McCloskey is one of my favorite children's books. You know what that sign means, don't you? Whoppie pies for lunch! Tommy got the famous brownie one. It was so big, even he couldn't finish it. The Kitchen Genius and I shared a pumpkin chocolate chip whoppie pie and it was so good, I'm determined to find a recipe in the fall when I have more time. Of course we also bought a bottle of blueberry wine, which was quite tasty with the cheese we found at a farm on the way home. The store owners gave us directions and we finally found Blueberry Hill. 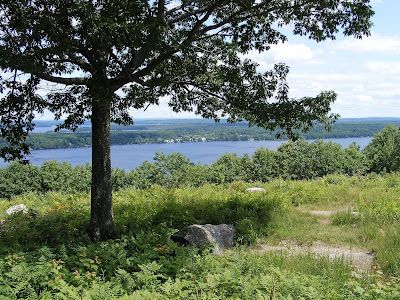 The view was magnificent - lake upon lake in every direction we looked. 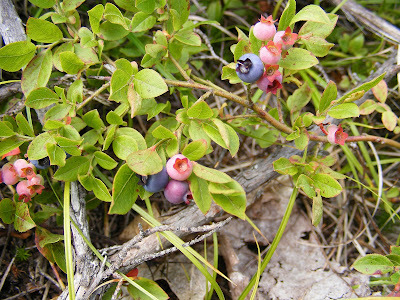 And the whole hill is indeed covered with blueberry bushes. We used the bags our whoppie pies came in to gather a few cups. It took a while because wild Maine blueberries are as tiny as a baby's fingernails and Tommy was just like Sal and little bear in the book and simply ate his way down Blueberry Hill. Back at the campsite I decided to make blueberry muffins over the campfire. Just kidding... My Mom was camping nearby in her beautiful camper that has a fully equipped kitchen, and she even had one of my favorite cookbooks, Recipes From a Very Small Island by Linda Greenlaw and her mother, Martha. I interviewed Linda and Martha a few years back when their cookbook first came out and they are incredibly nice as well as being being fabulous cooks. I planned to make their "Foggy Morning Blueberry Muffins," but my Mom didn't have any muffin tins in the camper, so I used the same recipe but put it in a loaf pan. I also added a thick layer of crumb topping because my blogger friend Dawn at Vanilla Sugar insists this is the best part. She's right! 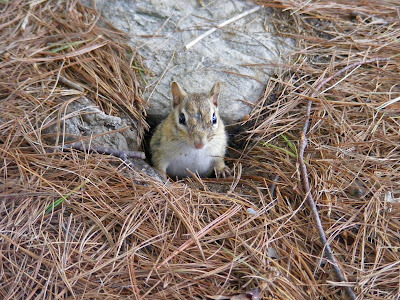 For my dear friend Jennifer, I'm also adding a few photos of the local rodents. 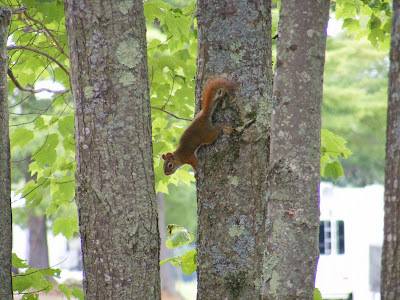 There were several very camera shy red squirrels, which are much smaller than our plump Cape Cod gray squirrels. 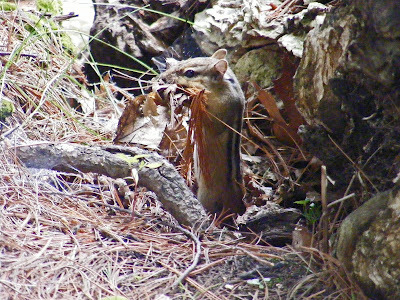 The kids named our resident chipmunk Chippy (Does every kid name a chipmunk Chippy?) Her hole was right next to our campsite. And how do I know Chippy is a female? She spent the whole week we were there gathering food - just like Sal's mom and me. 2. In a large bowl, cream together the butter and the sugar with an electric mixer. Beat in eggs, half-and-half and vanilla until the batter is smooth. 3. In a medium bowl, whisk together the flour, baking powder, and salt. Add to the egg mixture, whisking until fairly smooth. (The batter will be stiff.) Fold in blueberries. 4. Divide among the muffin tin, filling about three-quarters full. 5. Bake for 20 - 25 minutes, until the muffins are golden brown and a skewer inserted in the center comes out clean. Cool in the tins for five minutes and then unmold onto a rack. I made a large loaf of blueberry bread instead of muffins. I added a crumb topping made with 1/2 cup of butter and 3/4 cup brown sugar, and sprinkled it on top and then baked the loaf at 350 degrees for an hour. Your blog makes me 'oh so hungry'!!! 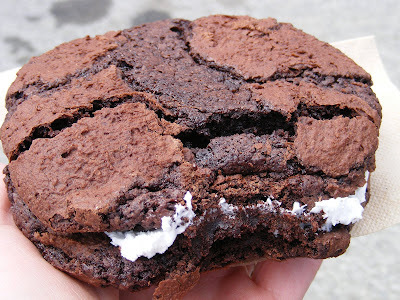 Would love a "Whoopi Pie"
that looks so lovely! i ADORE maine. hubs & i went there for our honeymoon and are dreaming of our 5 year anniversary trip back. beautiful! I don't know what a whoopie pie is, but I LOVE those blueberries! When I first started reading this post and saw those words of 'whoopie pie' I thought oh she better have some pics to back that up. You know I would have taken home a bunch of those pies. Man oh man they are huge. I was at whole foods today (coming home in all that traffic was awful this morning) and they had these wonderful wild blueberries from maine. I almost bought them, now I wish I had. those are some of the best blueberries I have ever seen! I have never been to Maine but I will one day! 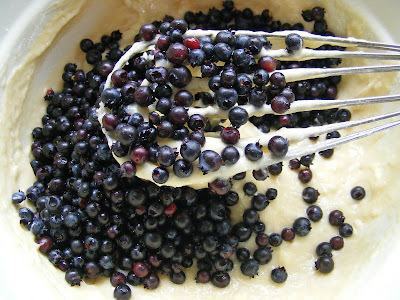 I love the looks of this blueberry bread and the topping makes it look even lovelier!! I have to try it. Blueberry wine.. yum! I love how you illustrated this post...I felt like I was going through a storybook! I LOVE THAT! Like the pic of the red squirrel, I've never seen one of those before! Thanks for sharing this! What a sweet post! The blueberries look so yummy. I kind of like how small they are - they look so cool in the bread. Like polka dots. What a beautiful place! Lucky you! To get those tiny little super sweet Maine blueberries! Ours are big and fat but I love those little Mainers. And Whoopie Pies- look out- we love those big time here! 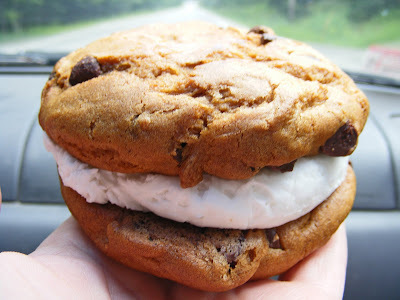 Ohmuhgoodness...I may have to make this RIGHT NOW!! It's OK to bake around midnight, isn't it?? Your whoopie pies have my complete attention! Now you know what a pictures is worth 1,000 words means! Talk about some gorgeous blueberries. 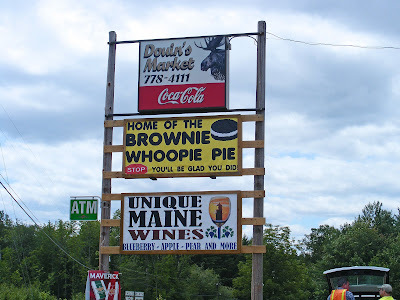 Sounds like a great trip - Maine is wonderful! Your blueberry muffins sound delicious, too! Please don't worry about it. I WISH I could have stayed longer. But, we will be back next summer, if not before. We'll have that coffee date someday! ;) YOU had to work...while I got to play. Both ways, time flies. Ugh. Sounds like a wonderful trip. The blueberries and that bread look delicious too. 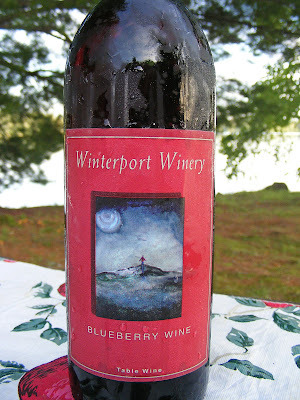 I have never had blueberry wine but it sounds like it would be really good. What a wonderful post! The pictures are so gorgeous and I think I might be in love with your blueberry bread. It looks amazing! As to your VT question the other day ... we have a place in Woodford, between Bennington and Willmington. Don't get up there as much as we'd like but I've been going for nigh on 29 years now and know the area well. We've been to the Bennington Monument several times and I just love it - especially the surrounding neighborhood. So pretty! I'm seriously drooling-- and I just had breakfast. Those whoopie pies are killing me!! I like your changes. I think your bread has the measles. What a lovely load of bluberries. 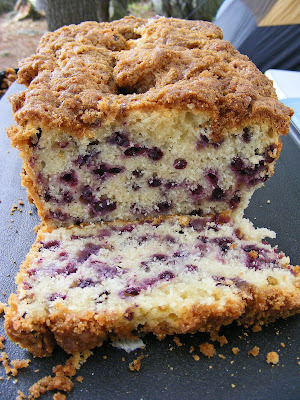 The blueberry bread looks fabulous, I can almost taste how moist and crumbly it is! Blueberry picking is certainly fun. What a neat place to visit!